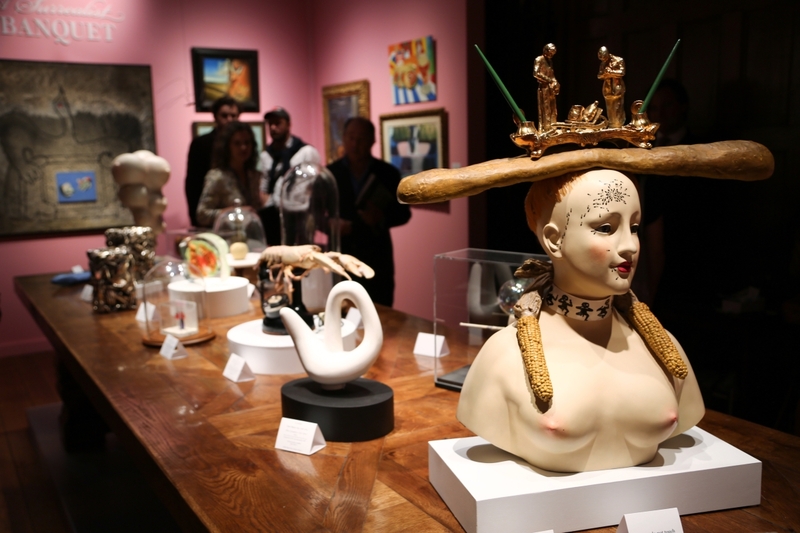 “A Surrealist Banquet” was on offer at New York City gallery Di Donna. Pictured front is “Buste de femme rétrospectif,” by Salvador Dalí, bronze and mixed media. 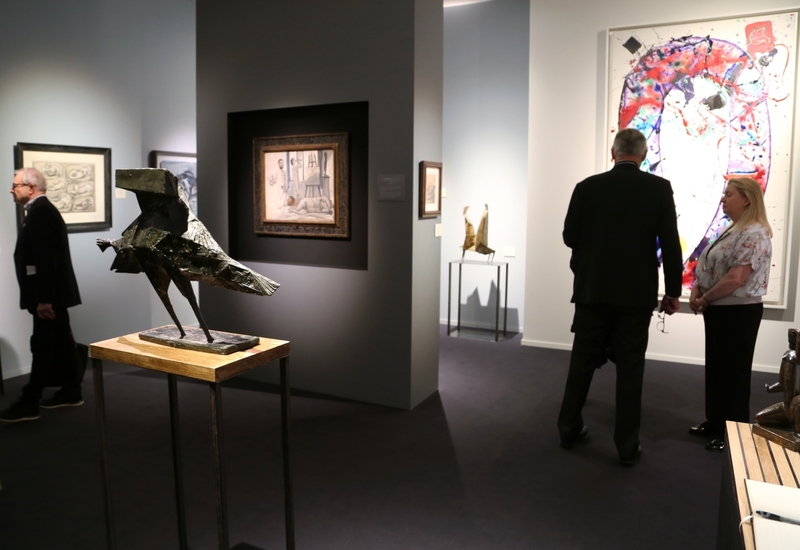 NEW YORK CITY – It was a fair fit for a king at the Park Avenue Armory as Manhattan welcomed TEFAF’s inaugural May 4-8 spring edition against a backdrop of Modern and contemporary art and design. The collectors were present, the dealers were selling, and the fair, by all measures, regaled its visitors with a sensory experience of material gravitas. 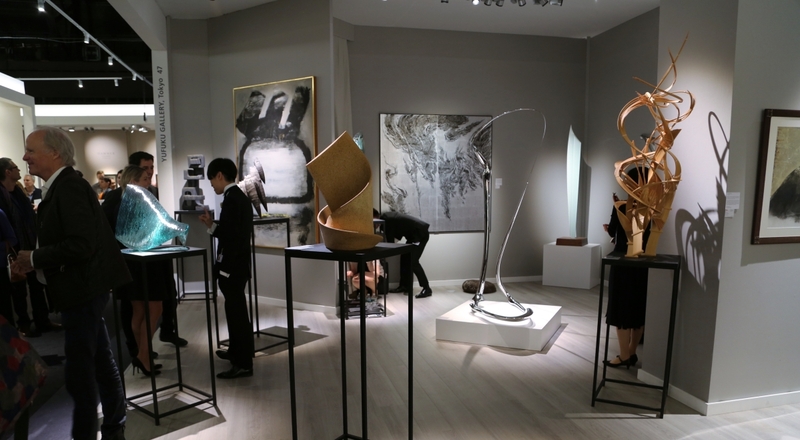 There is perhaps no other show that has the resources to transform the armory in the manner that TEFAF does. 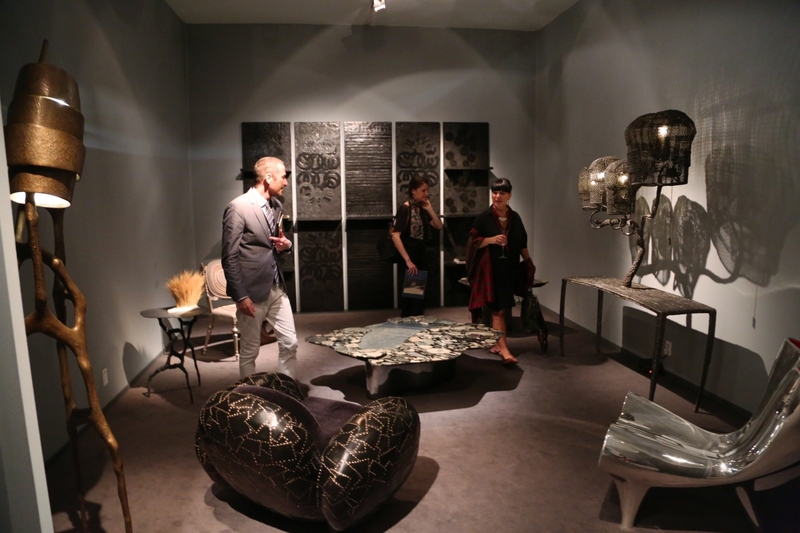 Ninety-three exhibitors from around the world joined hands to present a fair replete with Modern masters, antiquities and tribal art, contemporary artworks and examples of historic Twentieth and Twenty-First Century design. Managing directors Jeff Rabin, left, and Michael Plummer, right, stand with Howard Shaw, president and director of Hammer Galleries during the opening preview. 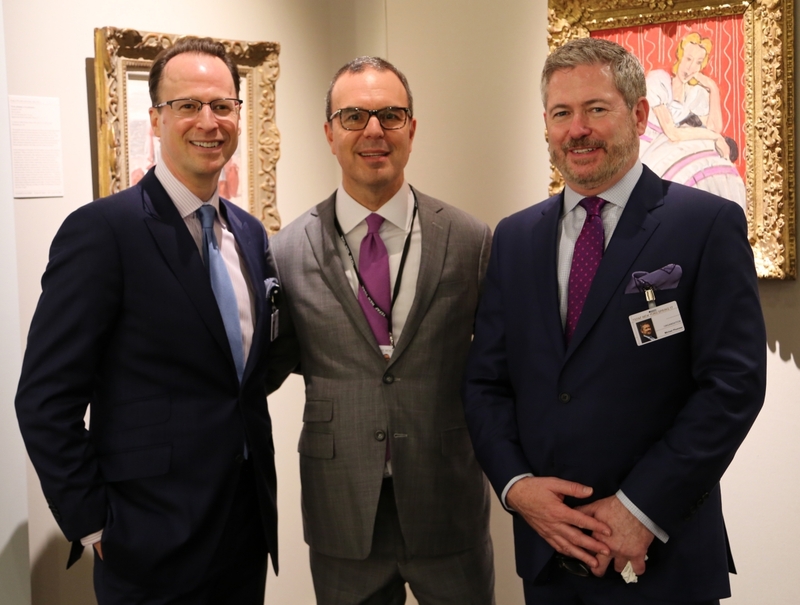 Managing show directors Michael Plummer and Jeff Rabin were found walking the show floor in high spirits during the opening preview gala as they dropped into conversations with international collectors and curators representing high-profile collections from around the world. Rabin emphasized that the show will propel itself forward with high curatorship and an exceptional visitor experience. 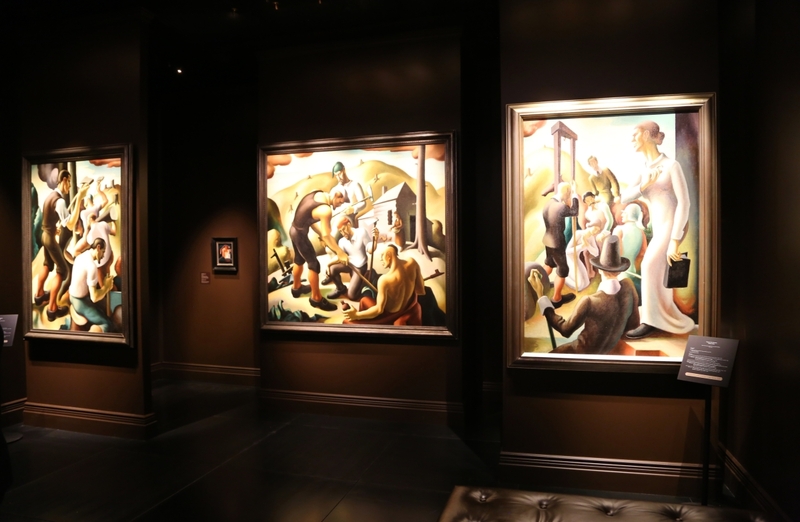 The air was buzzing in the booth of New York City dealer Bernard Goldberg Fine Arts as the gallery exhibited a group of three murals from Thomas Hart Benton’s “American Historical Epic.” “He doesn’t take heroes,” said Lisa Rotmil. “He wanted to get the people’s history… it was a call to shake up the mural world.” And Benton certainly did, the three murals featured weighty bodies and a range of color choices that brought a bold dynamism to each work. While Benton had donated ten of the 14 original works from the epic to the Nelson-Atkins Museum during his lifetime, the three on offer at Bernard Goldberg Fine Arts were discovered by the estate after the artist had passed, rolled up and largely forgotten. While the first epic focused on the conquistadors and the discovery of America, the second section, where these works hailed from, chronicled the settling of the American landscape. Men are seen clearing trees and establishing settlements, exchanging ideas with Native Americans and cultivating the land. The third section depicts the expansion westward and the conflict with the Native Americans. 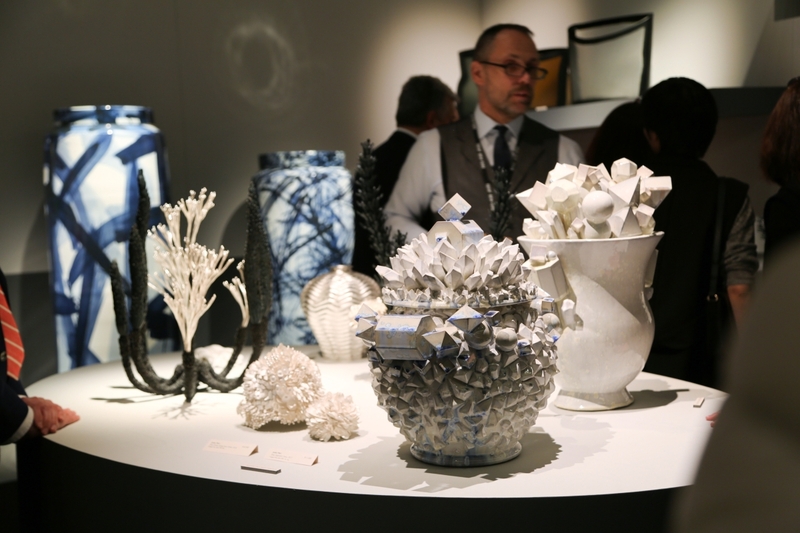 Adrian Sassoon, London, presented contemporary ceramic works by Junko Mori and Bouke de Vries. 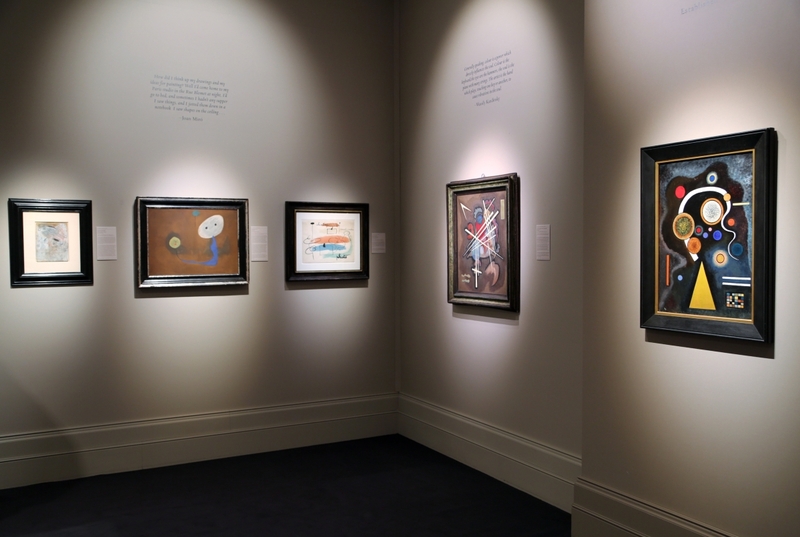 High-profile Surrealist, Modern and postwar works were on offer from New York City gallery Di Donna. As if they were hosting one of the liveliest dinner parties in the city, which is no small feat, the gallery’s exhibition, “A Surrealist Banquet,” featured a loud spread of sculpture and small works on a long dining table that extended through the middle of their upstairs space, offering works from Magritte, Dalí­, Jean Arp, Tom Wesselmann, Robert Watts, César, Hans Bellmer and others. The highlight work from Salvador Dalí­ was a bronze and mixed media bust of a woman titled “Buste de femme retrospectif.” The work was originally conceived in 1933 in porcelain and mixed media and was later cast in bronze in 1977, 11 years before Dali’s death. The bust sold to a collector during the show run. When speaking of Modern art, the conversations tend to drift to the same artists time and time again, with countless galleries offering works from the narrow selection of market-proven, blue-chip artists. Accordingly, there was no shortage of Twombly, Calder, Miró, Picasso, Kandinsky, Matisse or any other heavy hitters from the early Twentieth Century, but what was most certainly surprising to this writer was the presence of a noticeable amount of antiquities and tribal offerings on the show floor. 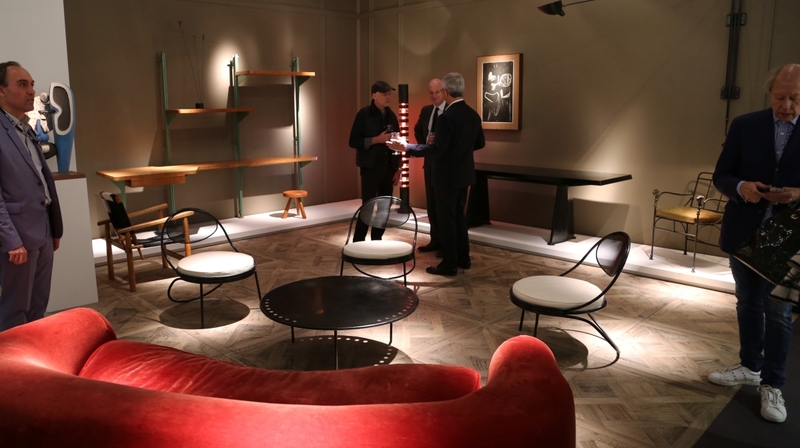 It was just not to be expected at the spring edition devoted to Modern and contemporary art and design, though it was welcome and certainly comes with precedence. 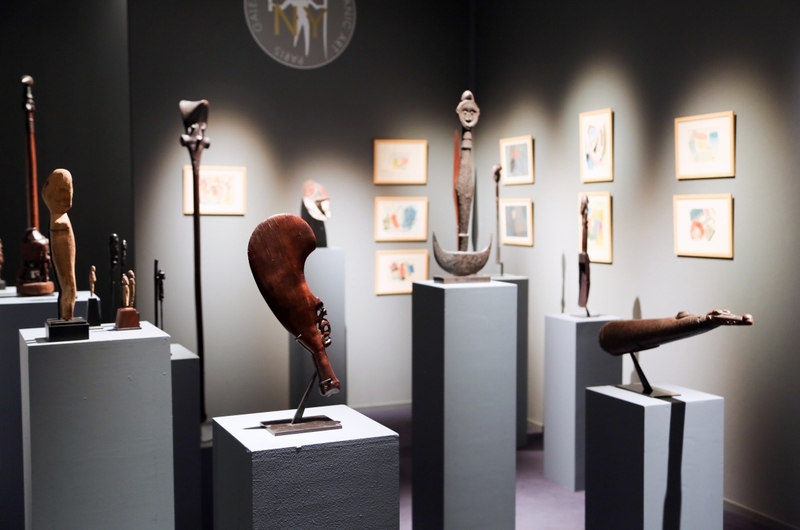 Tribal art has been at the heart of Modernism since Matisse and Picasso began adapting the imagery of African sculpture into their own works in the early 1900s. From the School of Paris, the spread of African influence in Modern art went to Germany, the United States and Italy and proved to be a bedrock of inspiration for the movement. With that in mind, the idea that these works are a part of Modernism is irrefutable, but it makes it no less surprising to see hand carved tribal art, which retains little in the way of an artist’s name, in a show flush with artworks where the name is arguably the most valuable aspect of a work. Paris-based Gallery Meyer exhibited a selection of works from their collection of oceanic and Eskimo art. The exceptional group of carvings ranged in use from the ritualistic to more utilitarian pieces. From the Sepik River in Papua New Guinea came a remarkable war horn carved in the shape of a crocodile. Highly stylized carving fleshed out the head of the crocodile and small notches extended down the body of the horn, one for every foe that had been killed in combat. The horn would have belonged to the whole clan, as opposed to any one individual, and was collected by an Australian naval military force in 1914. Three murals from Thomas Hart Benton’s “The American Epic” were on offer at Bernard Goldberg Fine Arts, New York City. 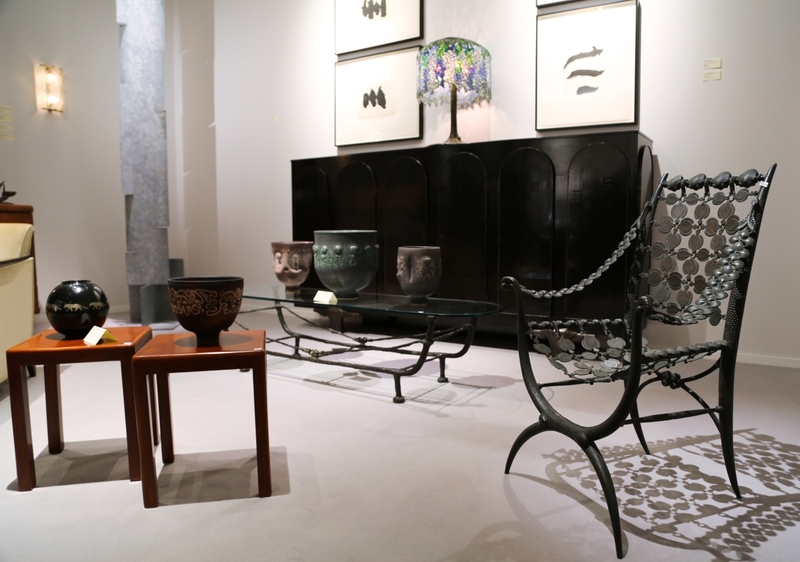 Design from the Arts and Crafts period on up through contemporary makers was represented by a variety of top-tier exhibitors. It can be said that not a single piece on the show floor was manufactured, but made by hand from the designer or their workshop. That distinction was evident in a portfolio of work that was both high caliber and entirely artful. 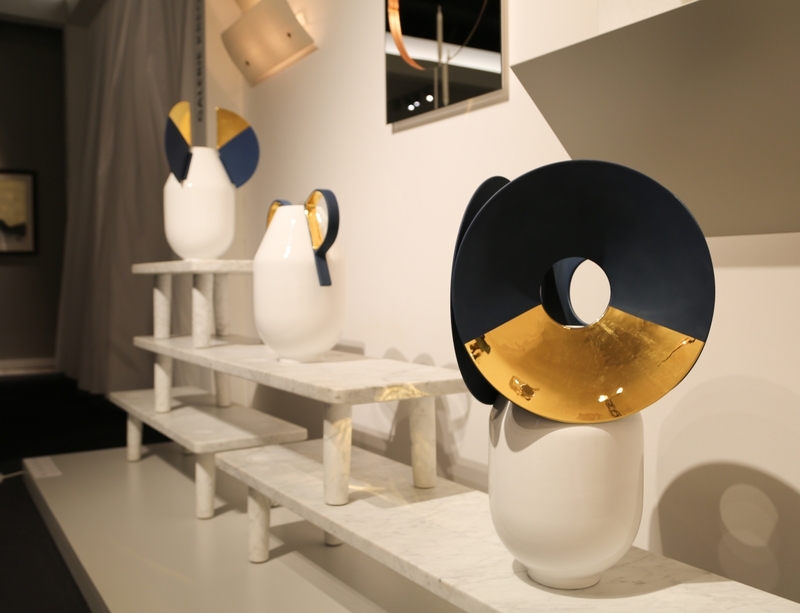 Works from contemporary designer Maarten Baas were on offer from Carpenters Workshop Gallery, London and New York City. The gallery brought a chair from Baas’s “Carapace” series that features small bits of patchwork steel joined by golden spot welds. The small patches allow the curves of the arms and back to roll over into a rather comfortable form. Also from Baas was the designer’s lauded “Grandfather Clock Self-Portrait.” In a primitive looking case of patinated brass and bronze, the clock face is a digital video of Baas drawing and erasing the clock hands as time passes with each minute. The self-portrait aspect of the video finds a playful tone in Baas. In between the minutes, the designer can be seen eating and wiping his mouth with his sleeve afterward. 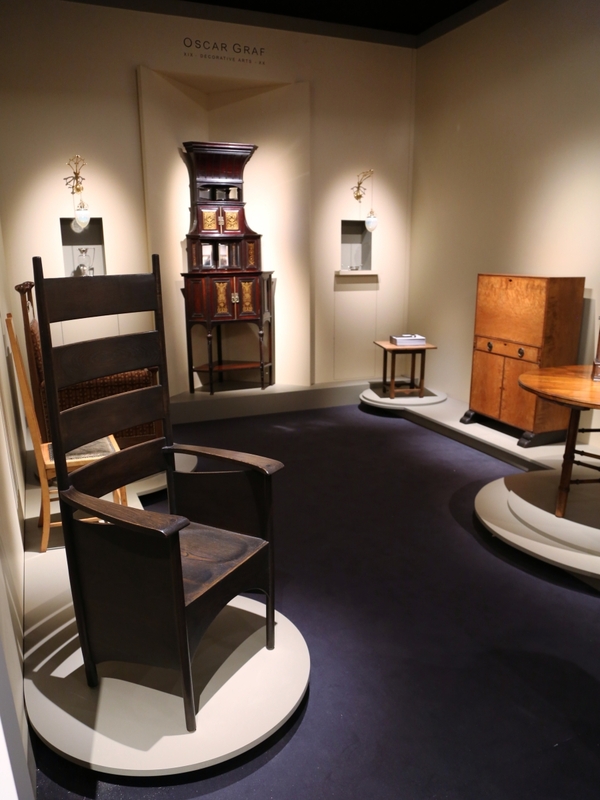 Oscar Graf provided a historical design exhibition of English Arts and Crafts decorative arts from a selection of greats in the field, including Charles Rennie Mackintosh, W.A.S. Benson, Christopher Dresser and others. A standout in the booth was an oak high back armchair made in the workshop of Charles Rennie Mackintosh. The chair was originally part of a set commissioned for Miss Cranston’s Argyle Street tea rooms and only four from this set are said to have survived. The other three are in institutional collections at Glasgow University, the Carnegie Museum of Art and the Toyota Museum of Municipal Art. 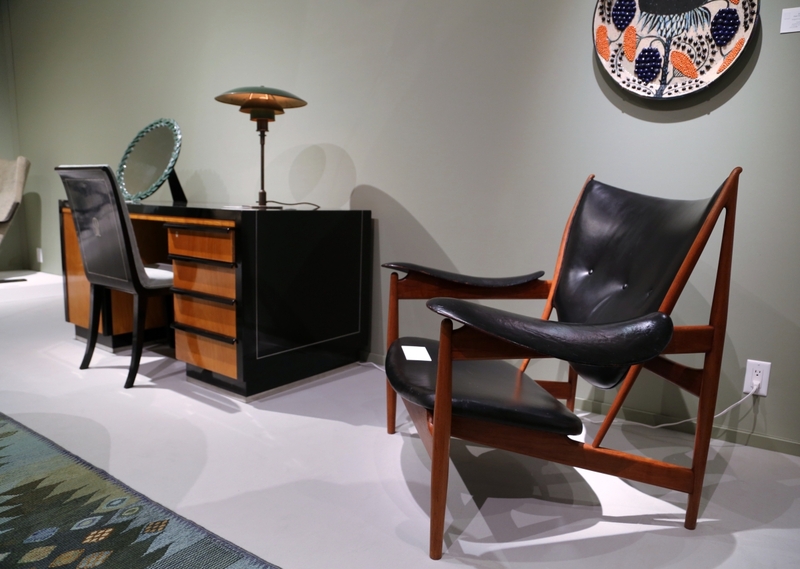 Another standout chair was found in the booth of New York City gallery Delorenzo as they featured a selection of works from French Art Deco designer Armand-Albert Rateau. Considered one of his first important commissions in the United States, the swimming pool of George and Florence Blumenthal would become the foundation for Rateau’s bronze furniture works that would go on to be counted as masterpieces. From this group came the bronze armchair “model no. 1793,” featuring a web of bronze cast components linked together to form a slinging seat, back and arms over a solid cast frame. Maritime motifs throughout, the back and seat feature interlocking and repeating fish, the arms appear with scalloped shells that are repeated in a larger scale on the crest of the chair and the frame is scaled and highly stylized throughout. 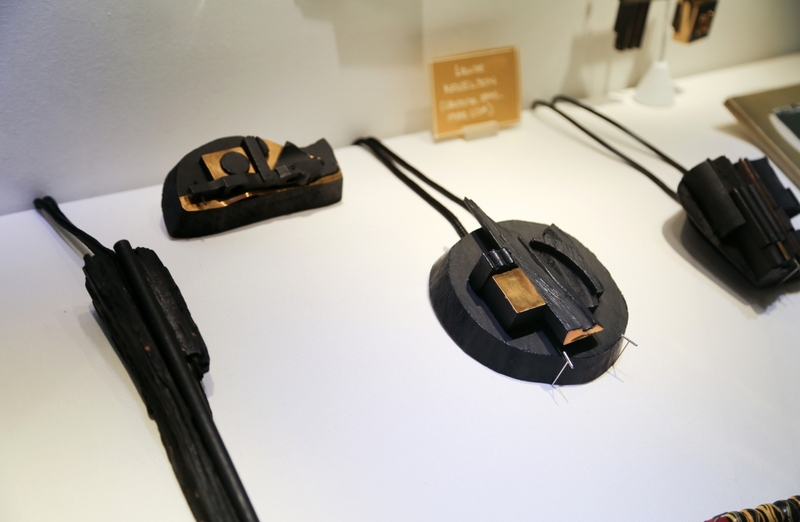 Necklaces by Louise Nevelson were on offer from Didier Ltd, London. Nevelson likely produced fewer than 100 pieces of jewelry during her career, making the collection at Didier a formidable share of the market. 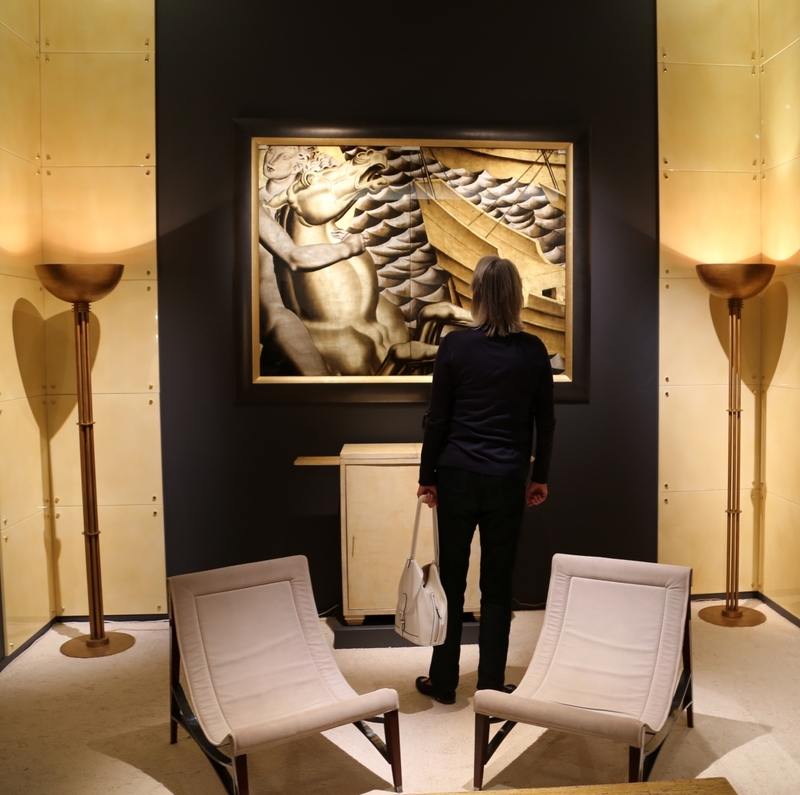 TEFAF will be back in October with their fall edition focusing on fine and decorative art from antiquity to 1920. 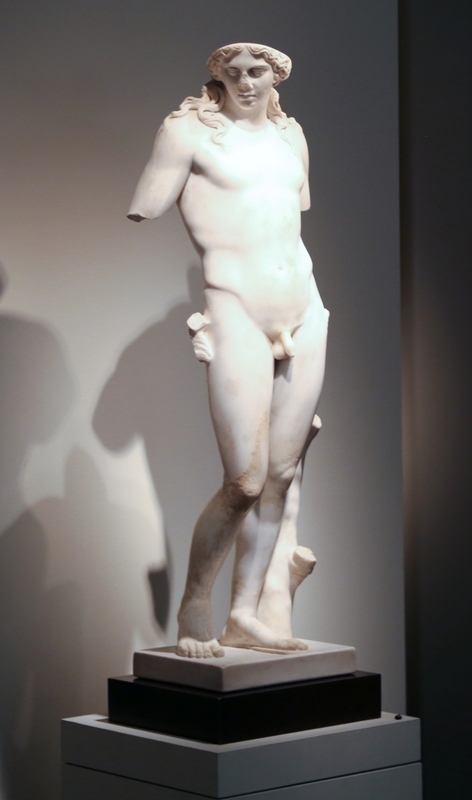 For more information, www.tefaf.com. 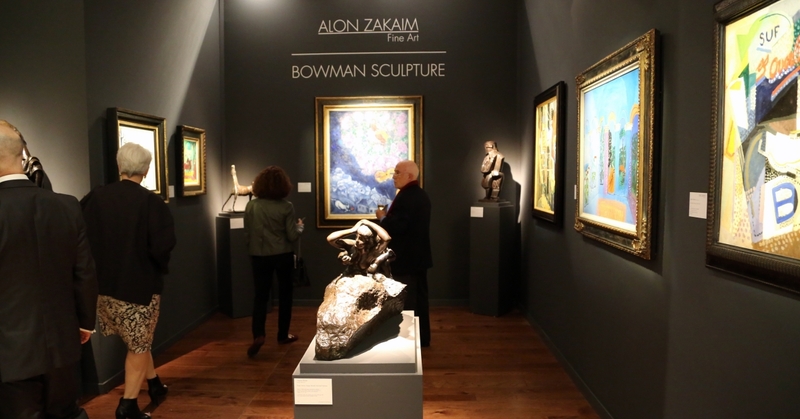 Alon Zakaim Fine Art shared a booth with Bowman Sculpture for this round of the fair. Front and center is a posthumous Auguste Rodin bronze casting of “Fugit Amor,” originally conceived by the artist in 1887.